Jan. 26 (UPI) -- The Daily Telegraph in Britain said it agreed to pay "substantial damages" and apologized to Melania Trump for "false statements" in an article about the first lady's life. The story entitled "The mystery of Melania" ran in last Saturday's Telegraph magazine. The piece described the "most private and enigmatic" of presidential wives after interviews with "White House insiders, Slovenian school friends and photographers." The newspaper on Saturday said the article on Donald Trump's wife should not have been published. "We apologise unreservedly to The First Lady and her family for any embarrassment caused by our publication of these allegations," the newspaper wrote. "As a mark of our regret we have agreed to pay Mrs Trump substantial damages as well as her legal costs." The article, written by Nina Burleigh, who works for Newsweek as national politics correspondent, was an excerpt of her upcoming book Golden Handcuffs: The Secret History of Trump's Women. The Telegraph removed the article from its website and published a point-by-point correction. "Mrs Trump's father was not a fearsome presence and did not control the family. 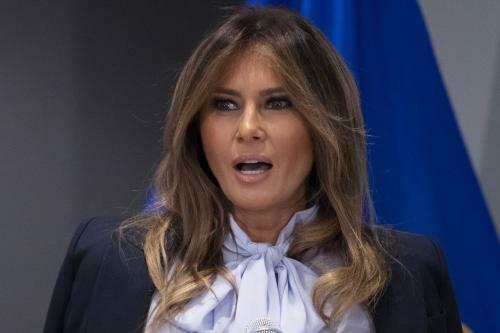 Mrs Trump did not leave her design and architecture course at university relating to the completion of an exam, as alleged in the article, but rather because she wanted to pursue a successful career as a professional model. Mrs Trump was not struggling in her modelling career before she met Mr Trump, and she did not advance in her career due to the assistance of Mr Trump. "We accept that Mrs Trump was a successful professional model in her own right before she met her husband and obtained her own modelling work without his assistance." The correction added: "Mrs Trump met Mr Trump in 1998, not in 1996 as stated in the article. The article also wrongly claimed that Mrs Trump's mother, father and sister relocated to New York in 2005 to live in buildings owned by Mr Trump. They did not. The claim that Mrs Trump cried on election night is also false." In April 2017, another British newspaper, Daily Mail, agreed to pay damages to Trump over published allegations regarding her modeling career. The payout was around $3 million, according to the BBC. That article appeared in August 2016 during the U.S. presidential campaign and was retracted two weeks later.